There's a lot about this kit that impresses, with its subtle looks, quality shells and keen playability making it a great beginner's kit that could also embarrass a few competitors at the next level up. At this price, kits need to be comprehensive, and Tamburo has bundled in a set of low-cost hardware to keep the price competitive - but needn't have bothered. It's the drums themselves that make this package stand out. Understated looks and impressive sound. You'd do well to replace the poor hardware. You´ve probably never heard of Tamburo drums - not unless you´ve done your fair share of music fairs in Frankfurt, anyway. Based in Sant´Omero, Italy, the company was started in 1984 by Tullio Granatello, who sought to create drums that were comparable to fine, stringed instruments. Tullio experimented with a variety of different woods and construction methods, and eventually settled on building drums with staved shells (like a coopered barrel). 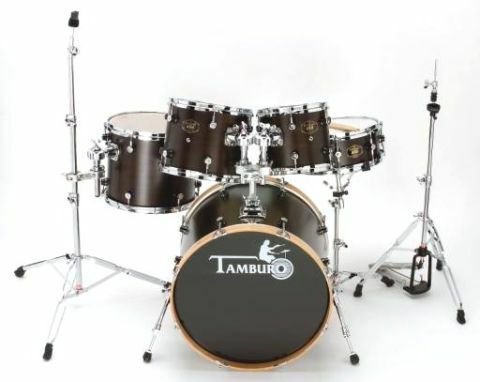 While this concept is not without its contemporary advocates - such as Brady with its block snare drums - Tamburo is unique in that it makes entire kits using this method. Of the five Tamburo ranges, only the top two - Opera and Formula - are built entirely in Italy. The remaining three - XD, Studio, and the subject of this review, the entry-level Ash Series - are all made in the Far East, but assembled in Italy. As the name suggests, the Ash Series drums are constructed purely from - you´ve guessed it - ash. Although a far more popular choice among custom drum makers for snare drums, this is still a fairly uncommon choice for drum construction, which is strange, as it´s actually ideal. Not only does it possess excellent tonal properties, but it´s exceptionally strong, easy to work and inexpensive. The Ash range is limited to two kit set-ups; a difference in bass drum sizes (20"x16" or 22"x16") is all that separates the blueprints. The range is also available in a choice of two matt lacquer finishes, either Transparent Amber or Transparent Black. Both bass drums are partnered by a 14"x5½" snare drum and 10"x9", 12"x10" and 14"x12" toms. Each kit is supplied with a trio of ball and socket holders (two mounted on the bass drum, the third with its own clamp), and a modest hardware pack that includes a hi-hat stand, snare stand, upright cymbal stand and a bass drum pedal. Our review kit is the 22" bass drum model finished in Transparent Black. First impressions count, so let´s deal with those first. The Matt finish is novel but is far from looking gimmicky. In fact, a more prolonged study reveals an understated and deeply attractive, winning look. In normal lighting the grain is only just visible beneath the black lacquer. However, stage lights reveal the grain flowing through it. While it´s not a kit that screams for attention, its subtle features suggest an inherent classiness. The lugs are a perfect illustration of this elegance and careful attention to detail. They´re beautifully proportioned, round examples made from a combination of metal and ABS plastic. Based on Tullio´s original design, the hybrid of materials is intended to absorb and eliminate internal lug vibrations. The shells they sit on are all six-plies deep and stand at a thickness of 6mm. Inside, the ash has been sanded and has the faintest hint of a purple hue. The bearing edges are also well cut, completing an overall tidy appearance to the shells. The shell hardware, and thus the rims and tuning rods, are all generic, but appear well machined. While not as chunky as die-cast alternatives, the bass drum claws have a grace of their own and curl around the hoops elegantly. As is often the case, the kit arrived with some of the drums packed within one another, Russian doll style. When we fitted the heads, we were impressed with the way everything slotted together; all of the threads were smooth and everything lined up precisely. The ball-and-socket holders are also more than up to the job. They are suitably flexible and sturdy, and sport memory locks to keep them in position. The bass drum post that houses two of the ball-and-socket holders contains an extra clamp for attaching a cymbal stand. If only the same sort of praise could be lavished on the hardware pack. The stands and pedals function, but they´re all lightweight in comparison to the modern standard. The hi-hat stand is small and very limited in height. The bass drum pedal works efficiently, but has an air of delicateness that sits uncomfortably with something that´s destined to be repeatedly trodden on. The snare stand is ok, assuming you don´t play with quite the same aggression as say, Travis Barker. Only the cymbal stand is anywhere near the sort of strength and size commonly found today. In this area of the market, costs have to be cut somewhere, and Tamburo has obviously chosen to do so here. This obvious economy is unfortunate, but suggests the majority of the resources have been spent on the drums themselves. In the grand scheme of things, this is a sensible priority. Stands are peripherals that can be acquired as you please, and getting the drums themselves right is far more valuable for your long-term interests. As a result, the actual drums do have an obvious quality to them. Ash is a very interesting wood, and on the evidence of these drums, it´s hard to understand why more drum makers haven´t explored its potential. It runs from a maple-like warmth to a brightness not dissimilar to that of birch, with the intervening mid-ranges being especially well represented. This means the bass drum sounds fat when tuned down, without the note dissolving into pure darkness. At the other end of the scale, it doesn´t lose its sense of size when tuned up either, though a little dampening was required to nip back an overtone on the front head. The heads are a little on the cheap side, but the drums perform eagerly. The snare is full of crispy brightness and responds well across the drum, and in terms of dynamics. There is plenty of body present to beef up a backbeat, and rimshotting adds a lovely metallic edge. The toms, while being an inch too long to be really up to the minute, are refined. Their attack cuts through without being overtly toppy, while the bottom end is rich without becoming lost in the mix. Strong mid-tones keep them powerful and clean, and the most basic of tuning banishes any overtones. All in all, a very musical set of drums.